15 Phone/Internet Sterling Sports Auctions (see website for details). 15 Phone/Internet Mile High Auction (see website for details). 15 Internet All-Sports Auctions (see website for details). 17 Phone/Internet RMY Auctions (see website for details). 17 Phone/Internet Robert Edward Auctions (see website for details). 22 Internet Sports Card Link (see website for details). 24-25 Long Island, NY Long Island (Hofstra) Show (see website for details). 25 Phone/Internet Worthridge Auctions (see website for details). 5-7 Dallas, TX Heritage Sports Collectors Auction (see website for details). 10-12 Phone/Internet Hake's Americana & Collectibles Auction (incl. baseball; website). 12 Phone/Internet Huggins & Scott Auctions (see website for details). 14 Phone/Internet Goldin Auctions (see website for details). 19 Phone/Internet Sterling Sports Auctions (see website for details). 27-29 White Plains, NY White Plains "Thanksgiving" Show (see website for details). 28 Phone/Internet Small Traditions Holiday Premium Auction (see website for details). On Oct. 1, 1932 in game 3 of the World Series at Wrigley Field, Chicago, what developed in the 5th inning will live forever in Baseball lore. When Ruth came to the plate in the 5th inning the noise level in the stadium increased dramatically. He was continuously jeered by the Chicago Cubs players and the Cub fans. With the count 1 - 2, he gestured toward center field bleachers as if to indicate that's where he planned to hit the next pitch. Charlie Root, the Chicago Cubs pitcher, delivered the next pitch and Ruth hit the ball sending John Moore, the Chicago centerfielder running back, then stopping. The ball landed 436 feet from home plate, the 15th and last World Series home run for Babe Ruth, the longest home run ever hit to that point in time in Wrigley Field. Matt Miller Kandle, Sr., a Chicago amateur filmmaker took a Kodak 16mm camera to Wrigley Field on that day and captured this event on safety film. However, viewing this film is not conclusive of the alleged call. 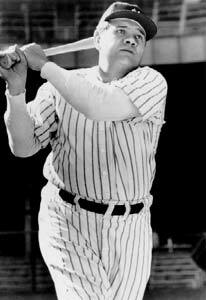 Earle "Doc" Painter, the Yankee trainer said: "..Charlie Root put over a called strike and the delighted fans roared. 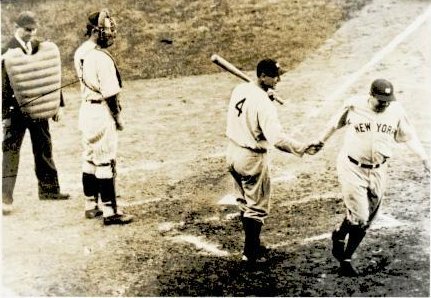 Ruth made a three-quarter turn to the stands and held up one finger...Root put over another strike and the Babe repeated the pantomine, holding up two fingers this time. Then, before taking his stance, he swept his left arm full length and pointed to the center field fence. When he got back to the bench after hitting the homer, Herb Pennock said: 'Supposed you had missed, you would have looked like an awful bum.' Ruth, drawing a drink at the water cooler, laughed: 'Hell, I never thought of that.'" Joe Sewell, the Yankee third baseman said: "....he (Ruth) didn't say a thing, and the next pitch was just a little above the knees. You've seen a golf ball hit, how it keeps rising, that's the way the ball went, and it went right through a tree outside the ballpark....don't let anyone tell you Ruth didn't (point) because I saw it." Gabby Hartnett, the Chicago catcher: "Babe came up in the fifth and took two called strikes. After each one the Cub bench gave him the business, stuff like he was choking and he was washed up. Babe waved his hand across the plate toward our bench on the third base side. One finger was up. At the same time he said softly, and I think only the umpire and I heard him, 'It only takes one to hit it.' Root came in with a fast one and it went into the center field seats. Babe didn't say a word when he passed me after the home run. If he had pointed out at the bleachers, I'd be the first to say so." Lou Gehrig, who was on deck when Ruth hit the home run, said: "What do you think of the nerve of that big monkey (Ruth) calling his shot and getting away with it?" Ruth himself is quoted as saying: "Aw, everybody knows that game, the day I hit the homer off ole Charlie Root.....But right now I want to settle all arguments. I didn't exactly point to any spot, like he flagpole. Anyway, I didn't mean to, I just sorta waved at the whole fence, but that was foolish enough. All I wanted to do was give that thing a ride... outta the park... anywhere." This is one of different accounts offered by Ruth over the succeeding years. The original audio sound track of Ruth's "Called Shot"
The Chicago Cubs radio announcer, Hall of Fame Broadcaster Jack Brickhouse, verbalized the action and drama on the playing field. This is an original sound track of this at bat by Ruth (due to the less than ideal quality of the audio, a word by word translation is printed below.
" the 1 and 1 pitch .. called strike 2 .. Babe let that one go past him also .. he never took the bat off his shoulder .. 1 and 2 on Ruth ..now Babe raises that finger again looks out at Charlie .. gets the sign from Gabby .. he's in the wind up .. here's the 1 and 2 pitch .. a swing ..a long fly .. it's toward that center field corner .. the ball .. almost in the exact spot that Babe has been pointing to .. here's Ruth around second on his way toward third .. (Jack laughing) .. as he comes into third .. (Jack laughing) .. as he comes into third he thumbs his nose in the direction of the Cubs dugout .. here he is around.... "
This veteran broadcaster spoke the words you have just heard (read) as the event took place. It was his perception that Ruth was indicating a home run to where he had pointed. This is probably the most credible evidence in favor of Ruth calling his shot. Ruth hitting the "Called Shot"
Ruth crossing the plate after the "Called Shot"
In the image (above right), Ruth is being given a congratulatory hand-shake by Lou Gehrig and watched by Cub Catcher Gabby Harnett and Umpire Roy Van Graflan as he heads toward the Yankee Dugout. 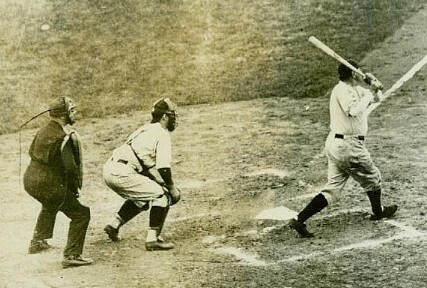 Moments later Gehrig followed with a home run on the first pitch. 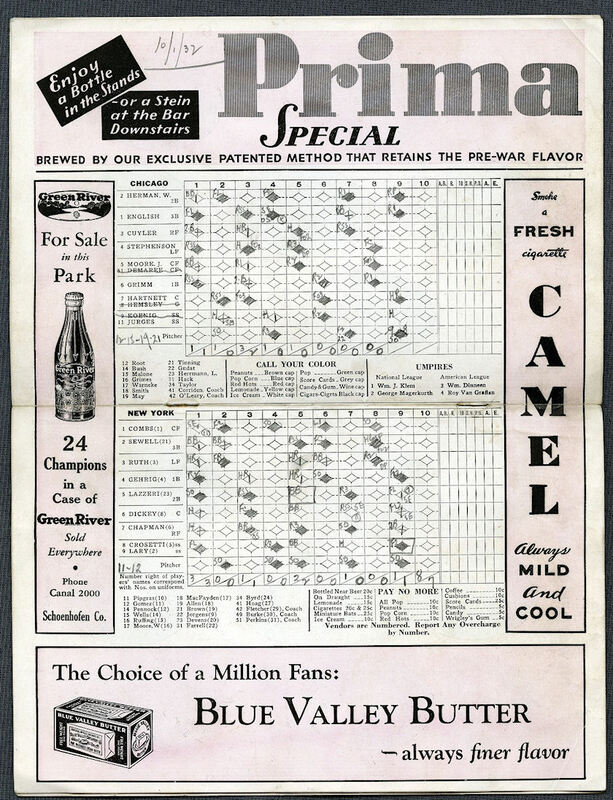 Jerry Spillman, the author of the above article, is a longtime vintage baseball card and memorabilia collector and once owned the scored scorecard booklet pictured above. According to Jerry, he wrote the article more than a decade ago and does not remember the source of the audio broadcast recording. 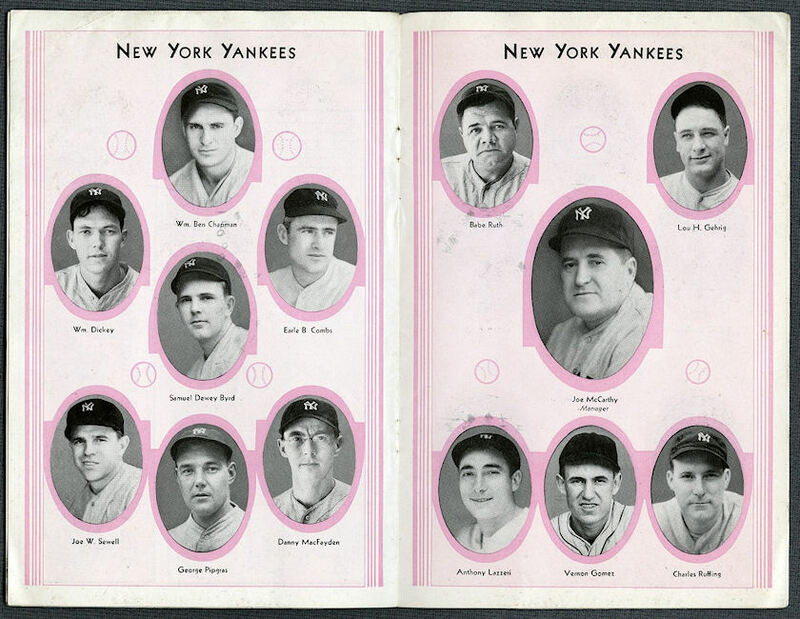 Updating the website with checklists and full set galleries for additional vintage sets is an ongoing project, so check back often to check out the latest additions. There are now many thousands of card images on the website and the list continues to grow every month. We welcome and encourage feedback with checklist additions, card images, error corrections and suggestions. Please send all input to editor@oldcardboard.com. Factory 30 Back Found for T201 Dougherty/Lord Card. 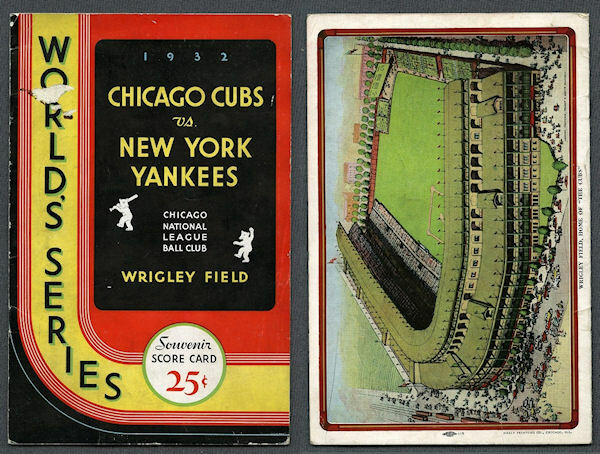 As discussed in Michael Wheat's comprehensive article about the century-old T201 "Double Folder" set in Issue #31 (Spring 2014) of Old Cardboard magazine, the card for Harry Lord/Patsy Dougherty with a Factory 30 back had never been reported in the hobby. Although all 50 cards in the set were known with "Factory 649" printed on Side 2, only 49 of the 50 cards were known with "Factory 30" backs. As a result of the article, however, the Lord/Dougherty card has now been found with a Factory 30 back. According to Michael, when one of our readers checked their collection after reading his article, the long-missing Factory 30 back was discovered. We can therefore now report that all 50 cards in the T201 set exist with both back variations.